The Commedia dell’Arte, was a form of improvised street theatre, which spread from16th-century Italy throughout Europe, and remained popular for around two centuries. Commedia dell'Arte troupes engaged in very physical acting using music, dance and acrobatics in their performances. While the plot was largely improvised, stock characters were used and were recognisable to the audience by their costumes, accents and poses. The popularity of this theatre form inspired paintings and decorative objects depicting the commedia characters. From the late 1730s and into the 1740s the Meissen modeller Johann Joachim Kändler produced a great variety of figures based on Commedia dell’Arte characters. On stage Commedia dell’Arte antics included bawdy humour which avoided censorship due to the improvised nature of the performances. 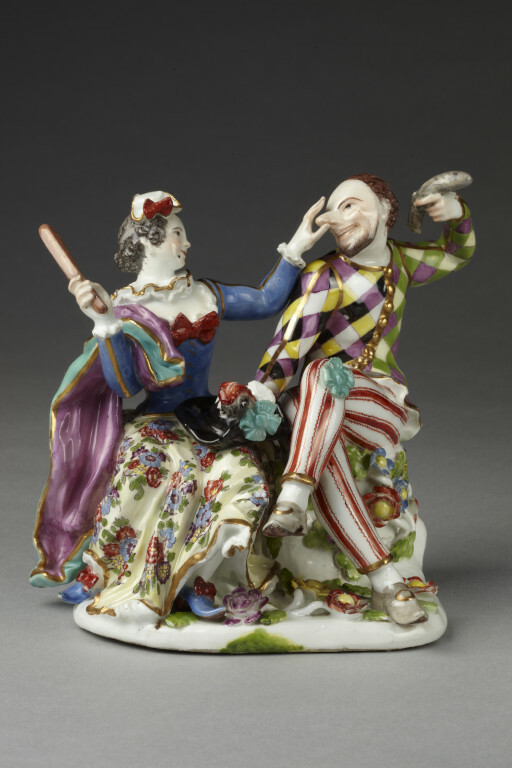 This model of Harlequin waving a sausage at Columbine, while placing his hat on her lap, refers to his amorous intentions. This group is first recorded in 1740 in Kändler's list of new models. 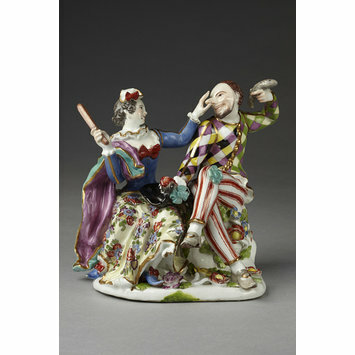 Figure group of Harlequin and Columbine in hard-paste porcelain painted in enamels and gilded. They are seated on flower bestrewn stumps on a flowered pad base. She is holding a slapstick in her right hand and tweaking his nose with her left. He is wearing a bearded mask and is holding a sausage in his left hand and rests his right hand, holding his hat, on her knee. She is wearing a white hat with a red rosette, a blue tunic, turquoise and lavender cloak, a flowered skirt and blue shoes all trimmed with gold. He is wearing a lozenge diapered tunic in lavender, green, black, yellow and white, red striped trousers with turquoise rosettes and grey shoes. The hat is black with red and turquoise feathers. Röbbig-Reyes, Michael. Selected Works: Early German Porcelain & Eighteenth-Century Art, Furniture, and Objets d'Art, Röbbig, Munich, 2013, p. 43. and p. 136. Figure group of Harlequin and Columbine in hard-paste porcelain painted in enamels and gilded, modelled by J.J. Kändler in 1743, made by Meissen porcelain factory, Germany, ca. 1745. Hackenbroch, Yvonne. Meissen and other continental porcelain, faience and enamel in the Irwin Untermyer collection. Cambridge, Published for the Metropolitan Museum of Art by Harvard University Press, 1956, Pl. 48, fig. 73 and pp. 79-80. Pauls-Eisenbeiss, Dr. Erika German porcelain of the 18th century. London & Fribourg, 1972, pp. 298-301. Jansen, Reinhard, ed. Commedia Dell'Arte, Fest der Komödianten, Keramische Kostbarkeiten aus den Museen der Welt Stuttgart: Arnoldsche, 2001, Cat. 22. Honey, W. B. Dresden china: an introduction to the study of Meissen porcelain. London: Faber & Faber, 1954, Pl. XLI (c).